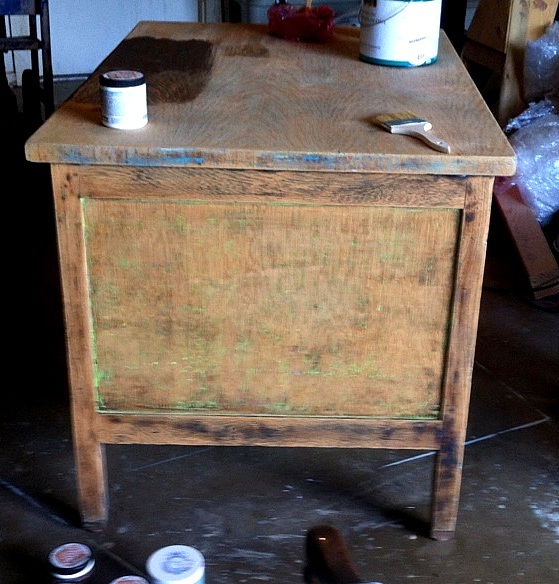 Ashley, one of my friends here in Lubbock is a teacher, and asked me to refinish a desk that was given to her. The desk was a little funky, but is very sturdy, and in great shape!! Ashley wanted the desk to be professional, but fun at the same time. She sent me a few pictures of what she liked/loved, but gave me free reign to do what I thought would look best. I love having free reign to work on a custom piece. It definitely makes the process a lot less stressful, and more fun for me of course! Like I was saying earlier the desk was a little crazy!! 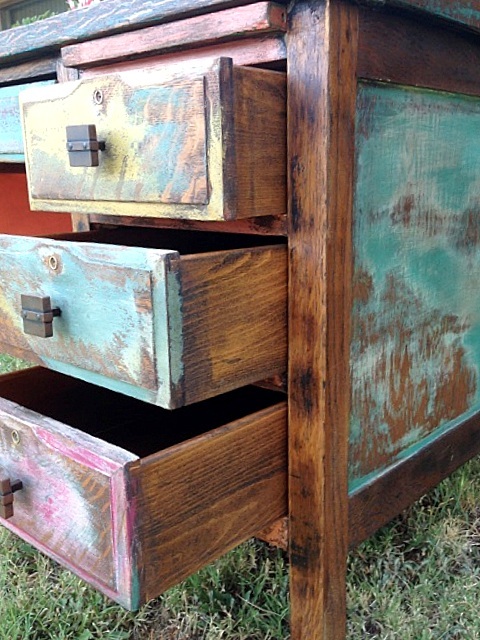 She wanted it multi-colored rustic similar to the picture below. In order achieve the look she wanted I had to strip the whole desk. 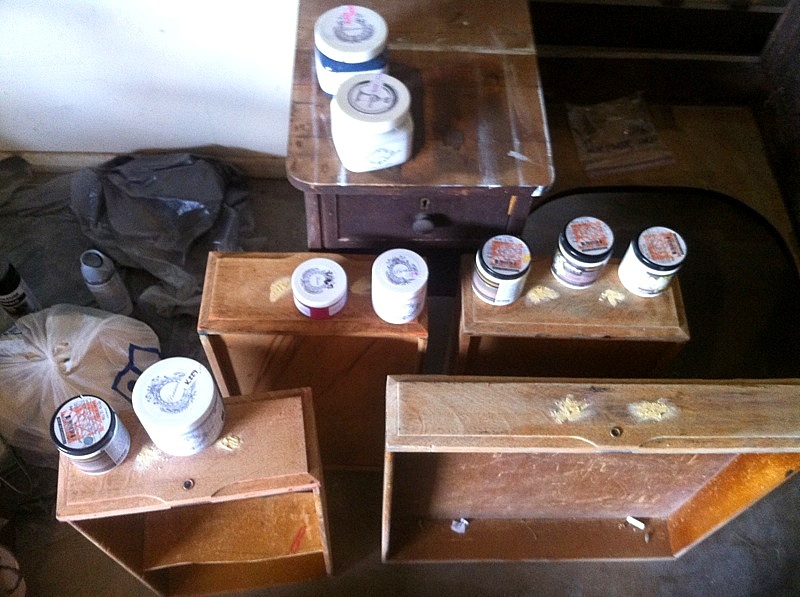 Since there was only ONE layer of paint I thought I would be able to sand the desk, and start painting right away. Wrong! Sanding barely took any paint off. I then resorted to my handy paint stripper. Thinking “this always works” I applied the paint stripper, waited a few hours, and attempted to scrap it off. Wrong again!! The paint stripper took off more then the sanding did, but still barely made a dent. I started getting a little frustrated not being able to figure out how to take the paint off of her desk. As I was applying another coat of paint stripper I rubbed the paint brush on an area that already had paint stripper. To my surprise some of the paint came off with every brush stroke that I made where the paint was wet. Hmm. Is water what I need to get this stubborn paint off? Yes! I ended up using water, and a soft bristle scrub brush. Worked like a charm!! So I didn’t get all of the paint off, but luckily for this type of painting it wasn’t necessary. 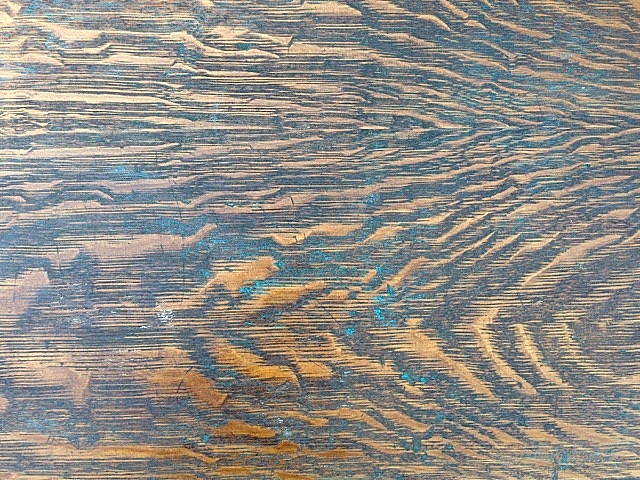 I now have a beautiful wooden desk; The wood grain on this beauty is unbelievable!! I really like the way the stubborn pieces of blue paint show through on the top. This adds a little color to the top without taking away from that beautiful wood grain!! Picking out the paint was really exciting! I got to pick out several different colors instead of one or two. 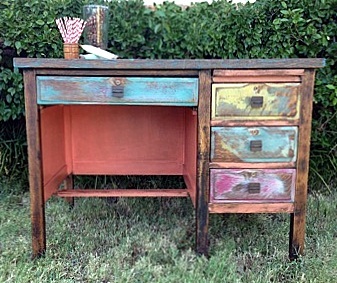 I used twelve different colors on this beautiful desk, sounds crazy right? The desk did not come with knobs and the previous holes had been semi-filled in. Time to go shopping!! At first I pictured beautiful, glass knobs. 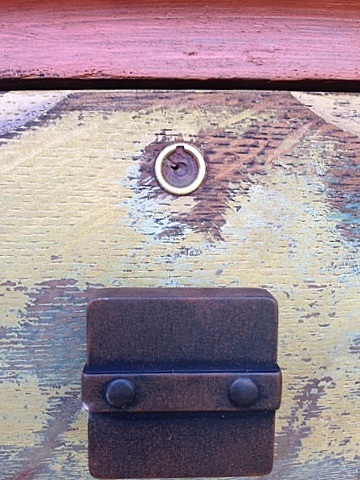 Max suggested bronze knobs since I was using a dark stain. When I got to Lowes, these were the first knobs I saw. They were the perfect size, shape, and a beautiful bronze! Here she is – professional and fun! I have so many picture’s of this beautiful desk that I want to share, but the post would be way too long. 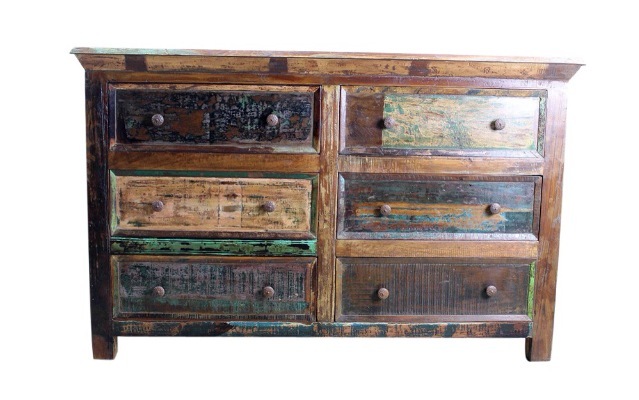 Be looking for a photo shoot with this rustic beauty, and a tutorial on my rustic painting process!! This entry was posted in Uncategorized and tagged bronze, colorful, custom, custom work, dark stain, desk, key holes, knobs, paint stripper, painting, rustic, rusticpainting, sanding, teacher, teachersdesk, wood, wood grain. What a unique piece! Well done! Just popping by to say thank you so much for joining in on my Making Broken Beautiful party last week! I hope you will come again! Thank you!! I’ve enjoyed linking up. Will definitely attend in the future. You are always welcome to do so! I hope you have a great day!